Kelly Roberts – famed child advocate and art therapist – writes, “Art therapy is about the creation and the discussion of the intent of the client. It’s a different way of sharing. No matter how healthy, verbal expression is the hardest thing to do.” Art, in other words, frees up the mind so that it may reconnect with the heart, creating a healthy atmosphere of sharing and understanding. Art therapy is an exciting and relatively young discipline, helping people of all ages cope with issues all while exploring creativity. Tile art is popular among many art therapists. 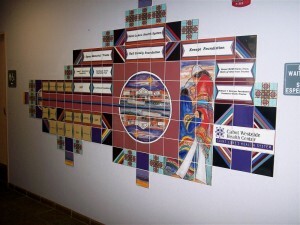 Hospitals and schools all over America utilize tile art as a means to commemorate and honor individuals, events, and tragedies. I have done many tile art pieces for hospitals. Therapy and tile art should really go hand-in-hand. The students draw up a design at home. They then bring the design to school and work closely with their art teacher. The project will not only honor the victims, but also to help the students better cope with the senseless tragedy. The article is an inspiring read and you can find it here. Art therapy is a powerful tool. It makes me proud to be an artist.